Via Deals we Like, Southwest if extending the double points offer for booking paid flights AND traveling on those flights up to June 15, 2013. You can register for the promotion via this page on the Southwest website. 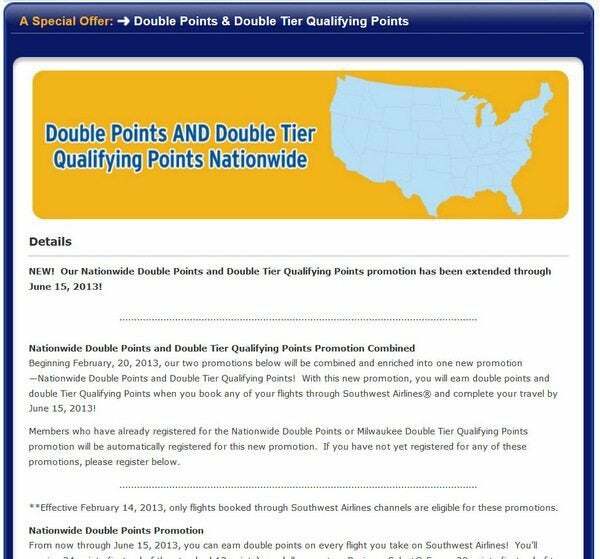 You will earn double points which you can redeem for flights AND earn double elite status points, as long as you book and complete your travel by June 15, 2013. 12 points (instead of six points) per $1 on Wanna Get Away fares. Each Southwest point is worth 1.67 cents towards the cheapest Wanna Get Away fares, so you’re getting 20 cents back per $1 spent or a 20% discount (12 Southwest points X 1.67 cents per Southwest point) for booking the cheapest Wanna Get Away fares. You can cancel your paid Southwest flights for free and get a credit valid for 1 year from when you made the booking. So it doesn’t hurt to see if the current prices for your upcoming trip are the same or lower than when you booked, and register for the double promotion and re-book. 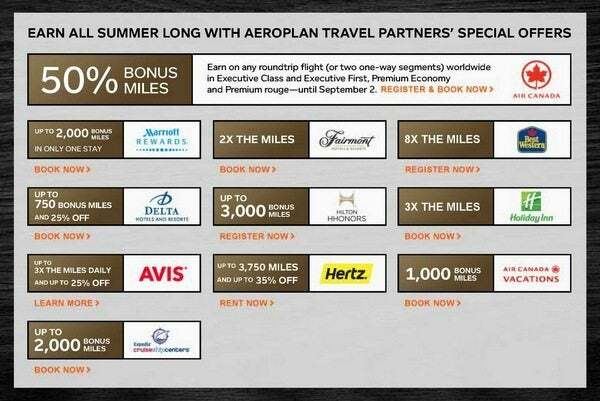 Loyalty Lobby writes that Aeroplan, the frequent flyer program for Air Canada, is offering bonus miles for select partner activity, through August 31, 2013. The contest is specifically targeted for Canadians, so it is unclear if US residents are excluded from the contest or if they are excluded from the partner earning as well. 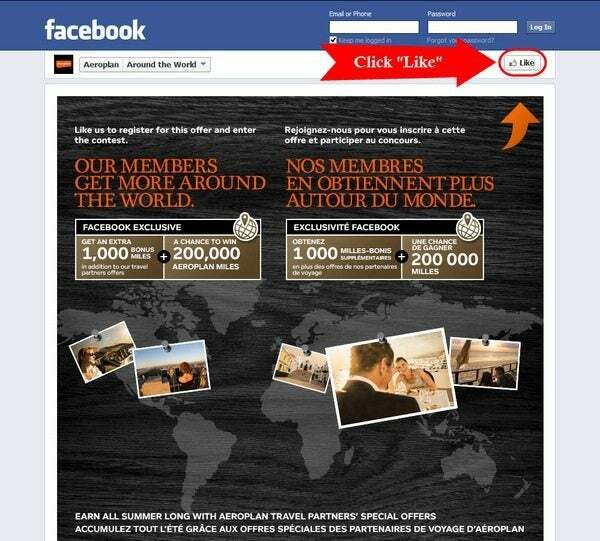 Go to Aeroplan’s Around the World page on Facebook, then click the “Like” button. 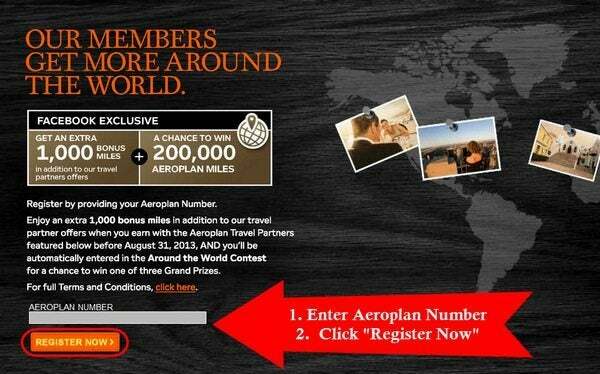 Enter your Aeroplan frequent flyer number on the next page. Then click the “Register Now” button. The Points Guy writes that United is offering up to a 30% discount on purchases of miles, through May 20, 2013. These miles can either be bought or gifted to someone else. Buying miles usually doesn’t make sense unless you need to top off your account for an award, or unless you’ve done the math to see that it makes sense for you. As always, just because something is on “sale” doesn’t mean it is a good deal! Through this offer, you can purchase up to 100,000 miles, which is the maximum you can purchase in any one year. Also, your MileagePlus account must have been opened for at least 10 days. Here’s a link to the Terms and Conditions of the promotion. American Airlines is offering discounted award tickets to Las Vegas through May 31, 2013. 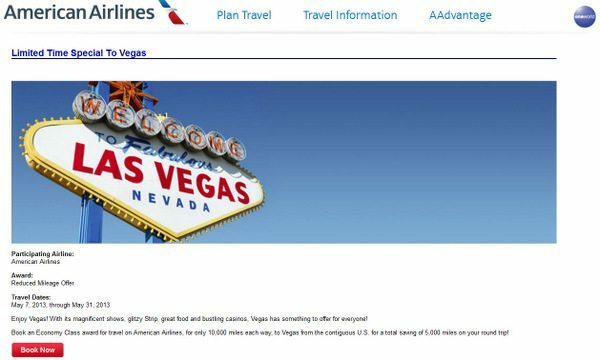 Through this offer, award tickets from within the continental US to Las Vegas are only 10,000 miles, each way. But it really isn’t worth it because of black-out days and the $75 close-in ticketing fee unless you were going to go to Las Vegas in any case. 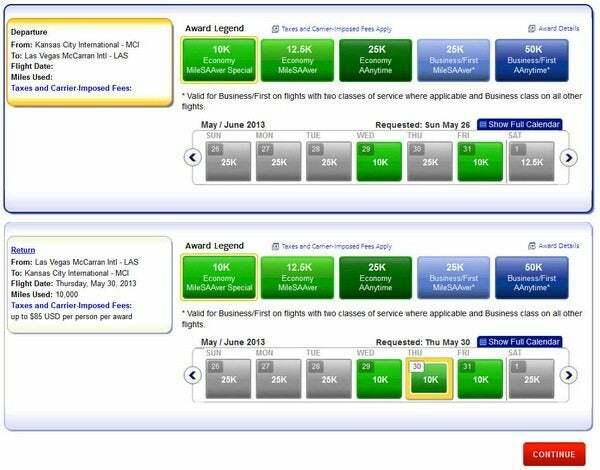 I did a quick search for flights out from Kansas City, and American Airlines website showed the award price as 10,000 miles each way for travel before May 31, 2013. However, travel from May 23, 2013 to May 25, 2013 and May 27, 2013 to May 28, 2013 is excluded from this offer, per the Terms and Conditions. So you just have a few days to take advantage of this offer! In addition, booking an award during before May 31, 2013 will cost you $75 extra for a close-in ticketing fee. So this isn’t really worth it unless you wanted to go to Los Vegas in any case. @Jason – 40k AFAIK. I saw a commercial on the TV yesterday for the CSP card but no mention of any bonus points. I was surprised. @Jason – It is currently 40,000 points, but it used to be 50,000 points earlier. Is it 50K or 40K for the sapphire? The only issue I see with Aeroplan is their disastrously high fuel surcharges. Unless there’s a redemption partner they don’t collect those for, they’re not much good. Really? Why are you being so nasty? I was just making a comment. I thought that’s what these pages were for. @Jana @ 333 Hand Lettering Project – Thanks for reading and for recommending the blog! @Laura R – Don’t worry about the mean comments. The comments are for sharing your thoughts and opinions, but some folks use the anonymity to say nasty things which they (hopefully) wouldn’t say to you in person. @ SHOOTER MCGAVIN golf pro – I WILL add you to the spam list if you persist in posting multiple times under different user names. Are we clear? @ Laura R, why did you post that? Now we are all worried sick about you. Because it is all about you.